Brooklyn Car Accident Lawyer Review: Kenneth S.
Home / Case Results / Brooklyn Car Accident Lawyer Review: Kenneth S.
On August 13, 2016, Kenneth was leaving his friend’s mechanic shop when he was t-boned by another vehicle travelling on Utica Avenue in Brooklyn, New York. As depicted below, Kenneth (in the red car) was waiting to safely pull into traffic when he saw another vehicle turn left across two double lines to enter the mechanic shop. Traffic had cleared and he proceeded to cross the same double lines when all of a sudden he was struck on the driver’s side by a speeding vehicle. Following the impact, Kenneth’s driver door caved in smashing into his ribs on the left side. The ambulance arrived to the scene and transported him to Kings County Hospital where he was diagnosed with four rib fractures and lacerations on his head from glass pieces of the window which had shattered. Kenneth was discharged from the hospital after six days, but continued having pain in his left rib cage and lower back. Kenneth needed legal help and he knew exactly who to call after hearing Adam Handler on Irie Jam Radio. “Adam is the same in person as you hear on the radio. When I met him, I immediately felt comfortable like we were family,” said Kenneth. Even though the speeding vehicle’s insurance company pointed its finger at Kenneth for causing the collision (the only witness of the accident refused to come forward), The Case Handler team stepped up to the challenge and successfully discovered a nearby camera that captured the entire accident. Since New York is a comparative negligence state, a Plaintiff can still recover money even if they are partially at fault. 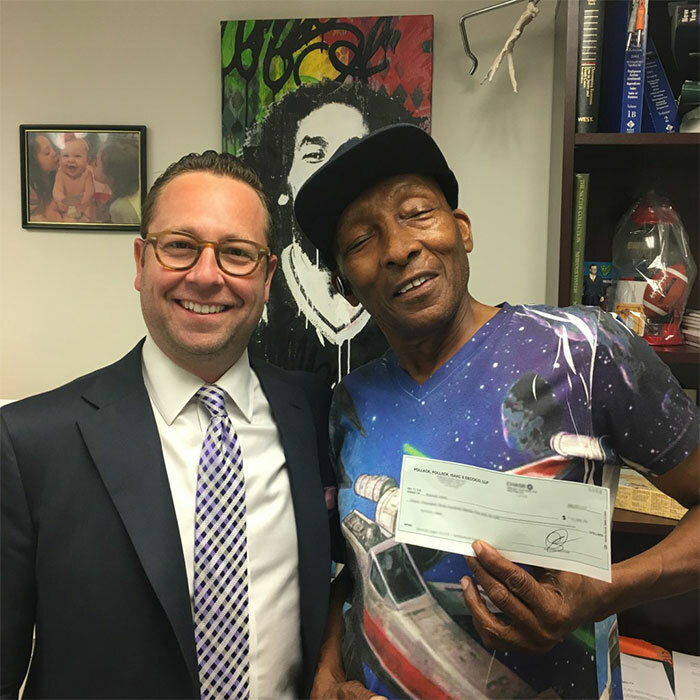 With the help of The Case Handler and our team of professional investigators, all of Kenneth’s medical bills were paid by his insurance company under New York’s No-Fault law and our client walked away with a high 5-Figure settlement! While we can’t legally say we are the best advocates, we can definitely say our clients are our best advocates. Thank you Kenneth for sharing your story and we will never forget you (especially with your uncanny resemblance to Pharrell Williams)! If you or a loved one was injured in a Brooklyn car accident, contact Adam Handler’s office at Pollack, Pollack, Isaac & DeCicco, LLP for a FREE consultation at 929-223-4195.